Adult Hemigrapsus nudus can be found under rocks and in crevices of the mid-intertidal on the open coast and in estuaries, here found on the Portside rocks in the South Slough. 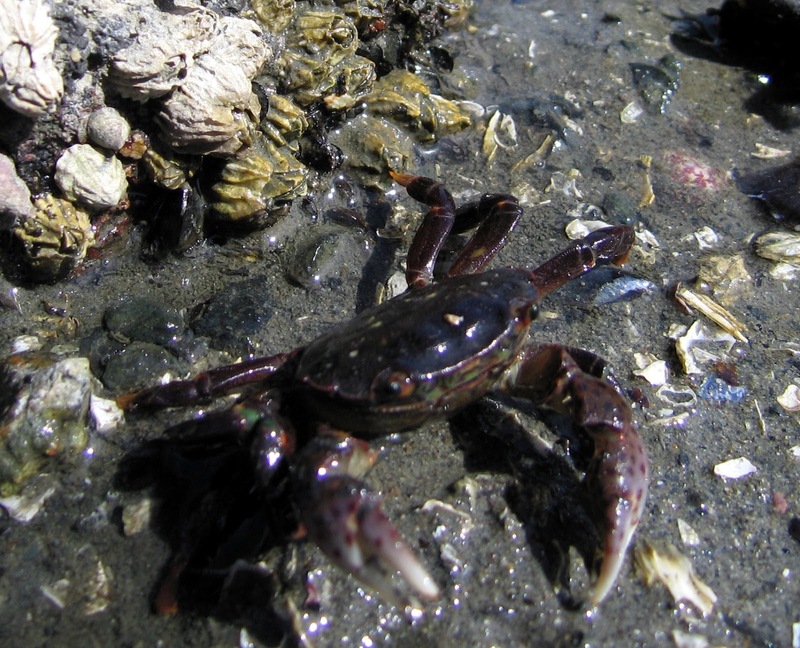 This purple shore crab is distinctive for the spots on its chelae, or claws. The female on the left measures 17 mm (11/16 in.) across. She is "in berry", in other words, carrying an egg mass. Crabs brood their eggs under the abdominal flap. As eggs emerge from the gonopore, they are inseminated by stored sperm from a prior encounter with a male. 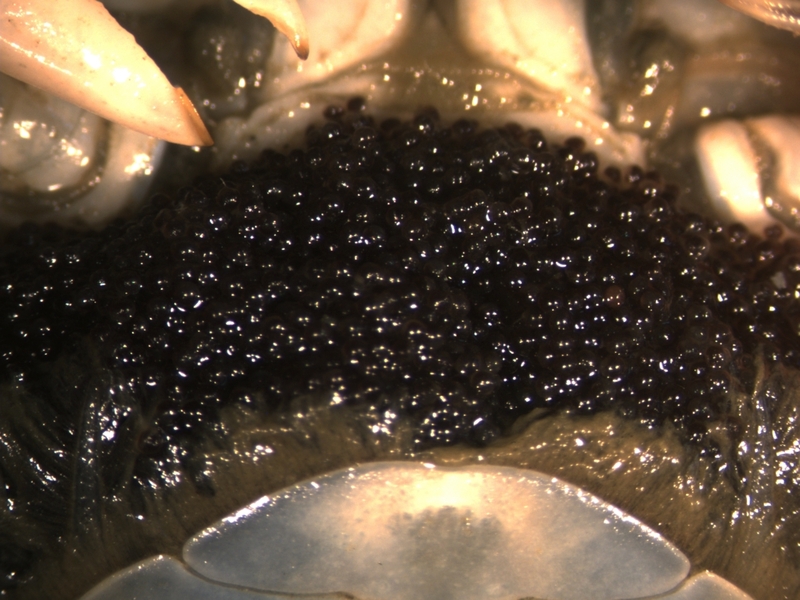 The eggs are attached to the setae (bristles) covering her pleopods, the abdominal appendages used for swimming during the final stage of the crab's pelagic larval life. Her broad abdominal flap forms a protective enclosure for the eggs. The female cares for the eggs, cleaning and aerating them, for up to four and one half months before they hatch as zoea larvae. 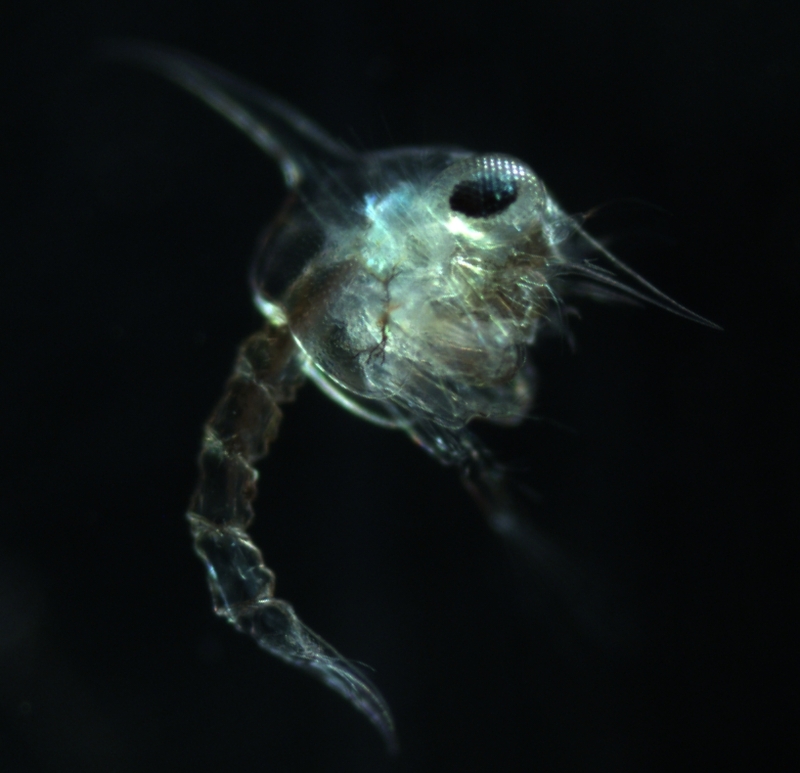 This H. nudus zoea hatched six days ago to swim and feed in the plankton and go through several larval molts before metamorphosing into a benthic juvenile. Two compound eyes look out with a multi-faceted view of its surroundings, the mosaic of images from many ommatidia, or eye-lets. A distinctive dorsal spine projects from the top of its carapace, and a rostral spine is located anterior to the eyes. These spines may discourage predation. Note a thin-walled sac at the base of the dorsal spine, the zoea's beating heart. The segmented abdomen ends in forked telson. 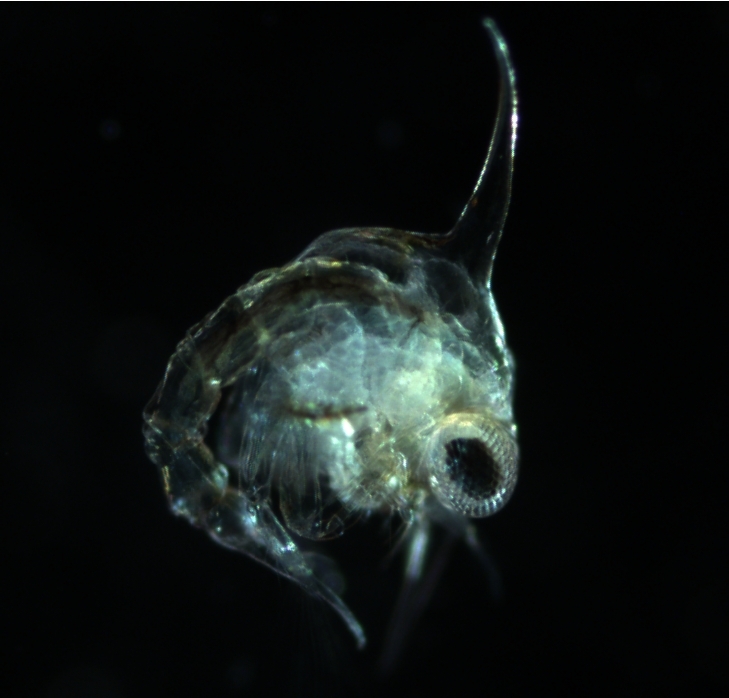 At nine days old, this crab zoea is close to undergoing a molt. The process of molting, called ecdysis, is characteristic of a large clade of animals (including arthropods and nematodes) known as the Ecdysozoa. A hard exoskeleton covering the body of these animals must be shed to accommodate growth. During successive molts of zoea, the abdomen adds new segments, and pleopods bud from them. Setae develop on the telson and the maxillipeds, the thoracic appendages present in newly hatched zoea. Hemigrapsus passes through five zoeal stages before becoming a megalopa. This stage resembles the adult form with stalked eyes and five pairs of pereopods (walking legs). The next ecdysis will take the megalopa to the juvenile stage and a benthic existence for the rest of its life.